Luton striker Jack Marriott always felt his luck would eventually change in front of goal this season. The 22-year-old has found it tough going at times, netting just three times in his opening 21 games. 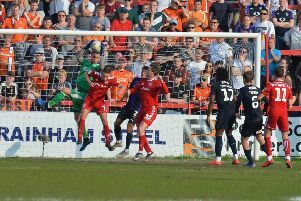 Marriott had gone 11 League Two matches without a goal, his last coming in the 3-1 win over Doncaster on September 21, before ending that drought on the half hour mark at Blackpool on Saturday. The former Ipswich forward now has three in his last three games after an FA Cup double over Solihull Moors recently too, said: “I continued to work hard every day and I knew it would turn around. “It was always a matter of continuing to do the right things and it would change and it has, thankfully. “It’s always nice to score in the league. I know I can do it, it’s just a case of waiting and keep doing the right things. It was always a matter of continuing to do the right things and it would change and it has, thankfully. Marriott’s goal when it came was a lovely finish too as taking Danny Hylton’s pass, he cut inside Tom Aldred’s attempted challenge and slipped the ball under Sam Slocombe. With his confidence restored, Marriott looked like the player who finished top scorer with 16 goals last term, particularly in the second half, with his direct running. He almost had a second too, curling narrowly wide, as he said: “Personally, I think I did everything right. “Obviously it’s nice to get the goal as well, which really topped it off. “The rest of it comes and I’m always working hard and always trying to do the right things and if I don’t score then hopefully I’m assisting as well. The goal also helped break the reliance that Hatters have had on Hylton and Cameron McGeehan recently, with the pair having scored nine of Luton’s 10 previous League Two goals. McGeehan’s second half header makes it 10 from 12 though, but Marriott said: “It’s good that Cam has continued his goalscoring form and Hylts as we know has been on fire. “It’s nice to get back amongst the goals, but everyone’s chipping in. Stephen O’Donnell has scored two from right back, two weeks ago.